Often, many people throw away grimy or dirty showerheads. Your bathing experience depends on the showerhead. You need always to have a clean showerhead that allows water to flow freely. We are not always sure of the particles that come along with the water in our showers. Some of the components are large enough to blog the showerheads. If water is shooting out of your shower in all directions, or there is no water coming out of the showerhead, then it is evident that your showerhead is clogged. It is not yet time to buy a new handheld showerhead; what you need is to keep your showerhead clean. You can remove the particles and mineral deposits that clog your showerhead by following this simple guide. The first step in cleaning your showerhead is to disconnect it. In this method, you will require some simple tools. Using a wrench, unscrew the nut at the shower arm. When doing this, make sure that you do not mar the fixture’s finish. If you are not sure of how to disconnect the showerhead, you can get the user manual from your manufacturer. Rinse out the loosened debris by running water through the showerhead. You should run the water while holding the showerhead upside down. Make sure that the water is enough to remove all the debris connected to the shower arm out. Rinsing the shower head when all of its parts are in contact will not entirely remove the mineral deposits. The next step is to disassemble the parts for thorough cleaning. This step is to help you remove the mineral deposits that couldn’t be removed by water. 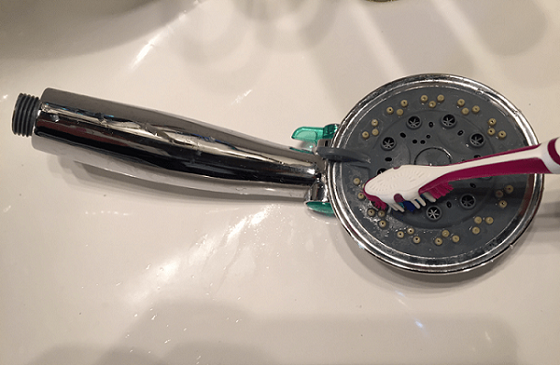 After you dismantle the showerhead, you can either use vinegar or an old toothbrush. 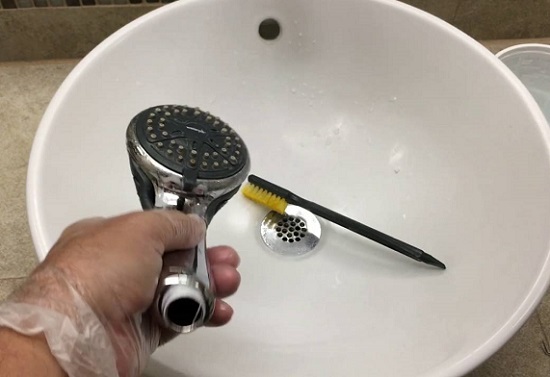 Scrub the showerhead using an old toothbrush to loosen debris. After the brushing, use a toothpick to poke out the mineral deposits in the holes. Once you are done, soak the showerhead parts in vinegar for 12 hours (you can soak them overnight), to dissolve the mineral deposits. Rinse the parts again. Reassemble the showerhead. Before reattaching the showerhead, wrap new plumbing tape around the shower arm to guarantee a perfect seal. 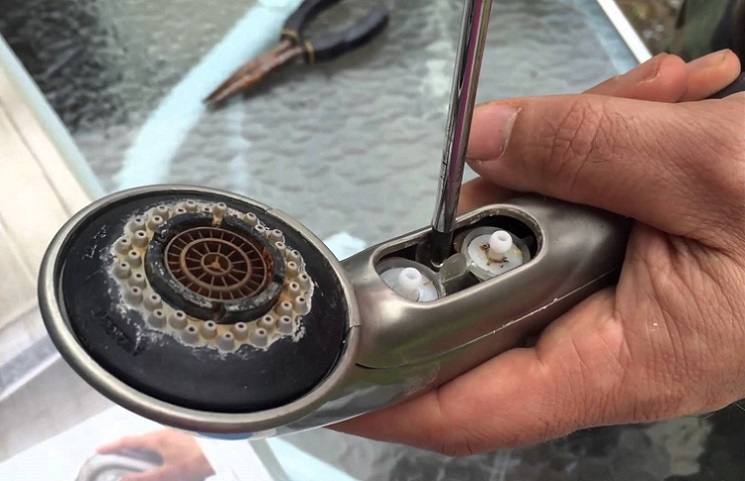 Using a wrench, reattach the showerhead. There are different methods you can use to clean your showerhead. If you walk down into a supermarket, you will find many chemicals advertised as shower cleaners. The other methods involve the use of harsh and harmful chemicals. Using chemicals can put us at high risk of being affected by other infections. It is regularly careful to use the right cleaner. 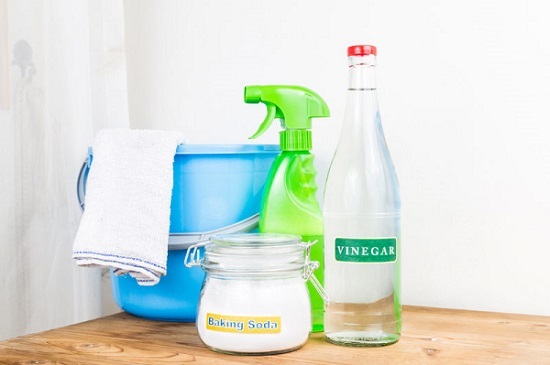 Vinegar a secure and powerful servant, you can use to clean your showerhead. It is both cheap and easily available. When using any type of cleaner in your restroom, you ought to dependably be cautious. As the bathroom is where a lot of our skin is exposed and we breathe in hot gases, it is continuously invaluable to go down a more common course of cleaning items. There are many awesome natural cleaning items available which work exceptionally well. In any case, on account of cleaning grime and lime scale from your shower head, you can’t go past the characteristic intensity of white vinegar. Majority of people utilize the shower once every day for cleaning up. Nonetheless, they may not know about the dangers of utilizing the shower, particularly when the shower head isn’t cleaned routinely and completely. Shower heads, especially dirty ones, can cause the spread of bacteria. This is not good for your health. To ensure that the showers you have at home are hygienic and won’t be breeding grounds for various types of harmful bacteria, you have to clean them frequently. Replace your shower heads at regular intervals, probably after every two years. Shower heads are low priced and such, it good to replace them when they have accumulated germs over a long time. Cleaning with vinegar and other kinds of descaling items can prevent bacteria and dirt but germs will return and manifest. The above steps guarantee you a clean showerhead; it is an eco-friendly method that will give you the best results. While following these steps, you need to be cautious and closely monitor your showerhead to avoid any mistake.